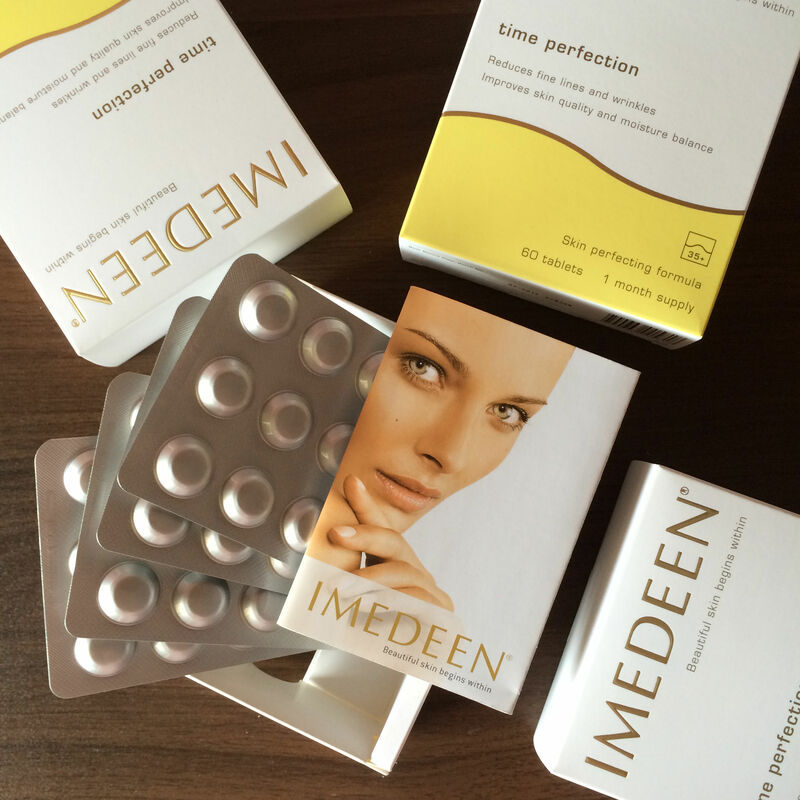 If you’ve read my post “8 Beauty Features for This CNY” earlier this year, you’d know that I started taking IMEDEEN Time Perfection skin supplements after reading up and finding mostly positive recommendations online. So after taking them for 3 months, here’s my review! So what’s IMEDEEN Time Perfection all about? Basically, IMEDEEN is all about tablet skincare; while beauty creams and serum work from the outside of the skin, Imedeen works on the inside of your skin, deep down in the dermal layer where the process of skin ageing begins. More specficially, IMEDEEN Time Perfection is based on an exclusive collagen rich Marine Complex foundation, but enriched with LycoPhence GS™ – a potent and patented antioxidant complex that helps protect skin against UV-induced damage and deterioration. IMEDEEN Time Perfection reduces the visibility of fine lines and wrinkles and other signs of ageing. There have been scientifically proven results in just 90 days, with more than 10 scientific studies carried out to confirm the skin-beautifying benefits of IMEDEEN skincare tablets. Model and maternal health advocate Christy Turlington Burns is the new global brand ambassador for nutricosmetics expert IMEDEEN beauty supplements (manufactured by Pfizer). A genuine advocate of the award-winning beauty tablets, Christy credits two daily tablets of IMEDEEN Time Perfection® as one of her secrets to maintaining beautiful, younger looking skin from the inside. The images above are taken from one of the scientific studies carried out on IMEDEEN. They confirm what’s happening in the invisible dermal layer of the skin and clearly show improvements after 3 and 6 months of use. The top black line depicts the outer layer of the skin, also called the epidermis. Below this is the supportive layer – the dermis. The coloured elements represent collagen, elastin, and moisture retaining elements present in the dermis. A high concentration and distribution of dark coloured elements indicates a good skin condition. My nails are also growing out to be stronger and they no longer chip easily. Thankfully I did not experience any weight gain due to the taking of these pills. Personally I am always interested to explore anti-ageing beauty / skincare products and supplements, so I wanted to give Time Perfection tablets and try and see its effectiveness. And I am happy to report that this product has worked for me and I will definitely consider this product as a collage supplement when I’m in my 30s. The recommended age for IMEDEEN Time Perfection tablets is 35+ so I am technically still young for it as I’m turning 25 this year. I personally also prefer taking this tablet skincare over collagen drink. The recommended intake is 2 tablets once a day. It comes in a box which lasts 30 days/1 month and the recommended course to see effects is 90 days. A box currently costs S$101.05 which works out to $3.40 daily, which is about the price of a collagen drink or cheaper. I would opt for these tablets over the drinks because I feel that these are more fuss free compared to drinking the collagen drink and definitely much more compact to bring around when travelling or even when buying them home (of course unless you buy online and opt for home delivery than its not an issue)! You can read up more about the product here and buy IMEDEEN Time Perfection with 25% GSS discount from the website here. Thank you IMEDEEN Singapore and Touch PR for sending the tablets for review. Disclaimer: The product has worked for me but I cannot guarantee that it will definitely work for you. I have taken Imedeen for close to 24-25 years and will never give it up! I am afraid of shrivelling up, looking like a deflated balloon. For me I will never go for Botox(not that I need it). 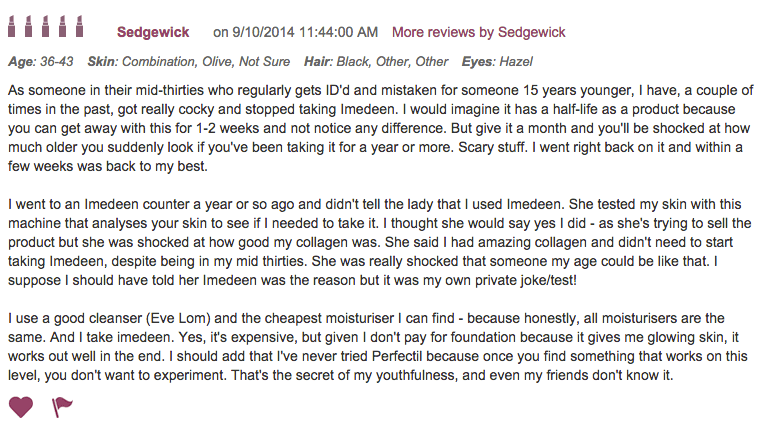 Hi Mary, thank you for sharing your personal review and insights from taking Imedeen. I’d definitely attest to its effects to and will consider taking in on a long term basis in the future. thank you for the information. I am 39 years old and am wondering for how long I should keep taking imdeen time perfection pills? Hi! I’ve been using imedeen before for years but now have stop due product not already available in Rustan’s Makati, Philippines. May I know where to buy some? Thank you! Please don’t reveal my full name, thnx again.